Designed specifically for the utility industry, NightRay’s durable design will last for decades, even in the harshest winter environments. Nov. 16, 2011 - PRLog -- NightRay remote controlled spotlights are the utility lineman’s lifeline during nighttime winter power outages and stormy conditions. Designed specifically for the utility industry, NightRay’s durable design will last for decades, even in the harshest winter environments. NightRay’s powerful spotlight beam allows nighttime utility workers to safety identify problem areas during power outages. 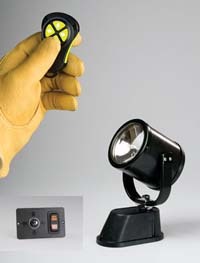 “NightRay is the most durable remote controlled spotlight on the market. We designed this spotlight with materials that could withstand severe winter weather, including ice storms, blizzards, and extreme cold.” explains John Herc, vice president of KH Industries. NightRay Spotlights were field tested by ATCO Electric in Alberta, Canada where the temperatures range from -40° to 100°F. “We’ve used the NightRay Spotlight on our utility trucks for several years. Our utility crews like the durability and versatility of the spotlights.” Explained Brad Hemstreet, fleet superintendent of ATCO Electric. NightRay Spotlights come with a variety of lamp packages, ranging from dual-filament flood/spot bulbs, to intensely bright H3 360,000- CP spotlight only, and KH’s new 750,000-cp HID Xenon model. KH Industries is a state-of-the-art US manufacturer of industrial-grade portable lighting and power products for the utility, fleet, construction, aviation, chemical, petroleum, marine, and agricultural industries. KH Industries is located near Buffalo, New York.